Do I have to pay then claim the grant back? Who pays for the grant? Through the ECO scheme, grants will vary from property to property and will vary depending on what works that are being installed. Generally larger homes and homes which are harder to heat such as solid wall properties or poorly insulated homes will get larger grants. Works which reduce heating costs the most will also result in higher grants so homes using expensive fuels such as on-peak electric and LPG will get a higher grant than a home using mains gas. Are the heating works always free? In some cases yes they are! In order to find out if the works are free we need to first need to find out more about your home to identify how much the grant is and then undertake a technical survey to find out how much the works cost. The cost of works will vary depending on the level of works required, a straight like for like boiler swap will be a lot less than installing a full heating system. You will be under no obligation to go ahead with the works if they do not end up being free of charge. We always do all we can to try and keep the costs down to make the work free but this is always determined by the amount of grant we can obtain for your from the funder. What works are covered by the grants? Grants are available for a range of heating and insulation works. If your home requires loft or cavity wall insulation this may also be free and we can undertake a survey for this. There are two ways that your home may be eligible, if someone in the home is in receipt of benefits, or if they are on a low income, possibly suffering from an illness. See our grants pages for more details. Happy Energy can offer you a boiler or heating grant regardless of where you live as long as you live in Great Britain and your home is privately owned or privately rented. In Devon and Cornwall we install works using our own qualified engineers and in other parts of Britain we work with carefully selected installers to carry out the work. What type of boiler will I get? I am a landlord, can I apply if my tenant is on benefit? Landlords with a property which has an EPC of A-E can obtain a grant for insulation or first time central heating, grants are no longer available for boiler upgrades. Landlords with a property with an EPC of F or G can obtain a grant only for solid wall insulation or a new boiler or heating where a renewable heating source is used. What if I don't already have heating? If your home has no heating at all then we can offer a grant towards the cost of installing a gas, oil or LPG boiler with radiators. The grant however is very unlikely to cover the full cost of works so you (or your landlord) will need to pay a contribution towards the cost of the works. What paper work do I need to show? Do I have to pay and then reclaim the grant? No. 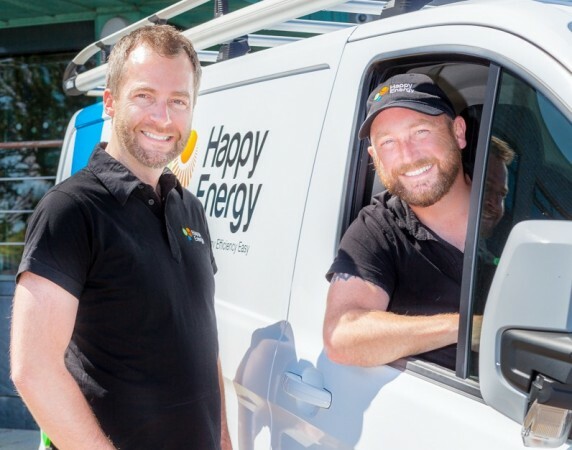 Happy Energy Solutions claims the grant directly from the energy supplier after the works have been completed. If however the grant does not cover the full cost of the works you will need to pay for your own contribution prior to the works commencing. Remind me again what benefits I need to be on? Great I want to apply! Now what? Fantastic! Please fill in the form at the top of the page and we will then be in touch to discuss the process with you, or call us Monday to Friday free on 0800 0 246 234.